If those phrases make him sound as if he's living in denial, there is no denying this: A loss Sunday at the New York Giants (2-0) would leave Washington in a big hole in the NFC East, three games out of first place just three games into the season. 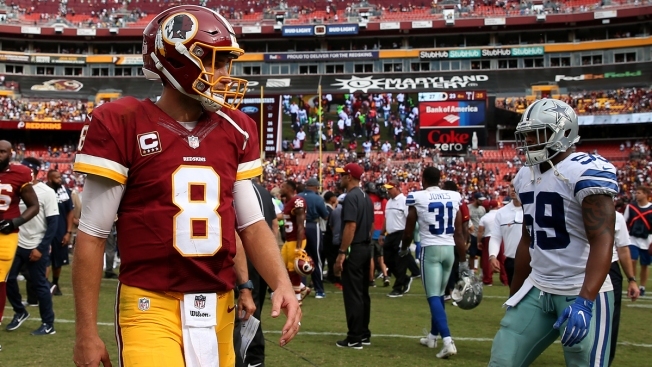 A year after winning their division behind a career season from Kirk Cousins, the Redskins have reason to wonder what is going on with the QB. He has one touchdown pass and three interceptions, including an end-zone pick on third-and-goal from the 6 in the fourth quarter of Sunday's 27-23 loss to the Dallas Cowboys. There have been problems in the red zone. And on third downs. Cousins' passer rating of 78.5 ranks 27th in the league. He has not been very accurate: Against Dallas, Cousins overthrew wide-open receivers DeSean Jackson and Jamison Crowder on plays that very easily could have been TDs. No quarterback has thrown more often than Cousins' 89 attempts through two games (Jacksonville's Blake Bortles has the same number), and Washington has run the ball a grand total of 29 times, a division of labor that might not serve the Redskins well against the Giants' revamped defense. In addition to sounding an optimistic tone Monday, Gruden did say there is plenty his players and coaching staff needed to improve -- on offense and defense. NOTES: NT Kedric Golston went on IR after injuring his right hamstring on the first play from scrimmage against Dallas. In other moves, Washington brought up rookie DL Matt Ioannidis from the practice squad and added three players to the practice squad: LBs Jason Fanaika and Amarlo Herrera, and DL Bobby Richardson.